We have made it exactly halfway through our intern session for the 2011 year (see article about the selection process here). We have a class of five interns representing four schools – St. Pius X, St. Agnes, Second Baptist and Bellaire High School. The interns are following a six week course schedule designed by STP Images to give a well rounded look at business and specifically, the business of photography. The first three weeks included high school senior portrait sessions for four of our 2012 Seniors (Jessie, Mable, Ross and Emily) in week one, the planning of a shoot for another 2012 High School Senior (Judie) to teach the interns how to go through the consultation process in week two, and in week three we completed then the actual portrait session that we planned in week two for Judie. Our interns are learning a lot and they are so enthusiastic – their energy is infectious. While the first three weeks focused more on the ‘art’ of photography, our next three weeks with the interns will focus more on the ‘business’ of photography – intellectual property rights, post-processing of images in Photoshop and the compiling of images for a successful sales process. We know these next three weeks will fly by, so I have decided not to waste any more time getting some intern images posted. 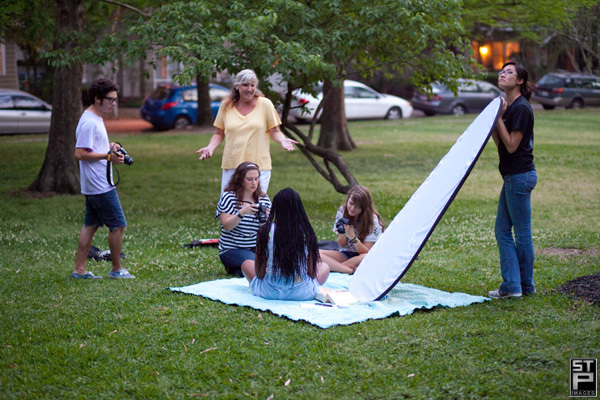 This first teaser is our group senior portrait session with Judie this past Tuesday night. Over the course of this week, we will post some of the high school senior portrait session images from our intern sessions. If you have a high school senior in need of some incredible senior portraits, don’t waste another day! Give us a shout in the studio today and let us show you just how awesome STP Images is.